SUEDE COAT Gestuz. SWEATER & Other Stories. NECKLACE Maria Nilsdotter. BAG Jimmy Choo. JEANS J Brand. BOOTS Acne. 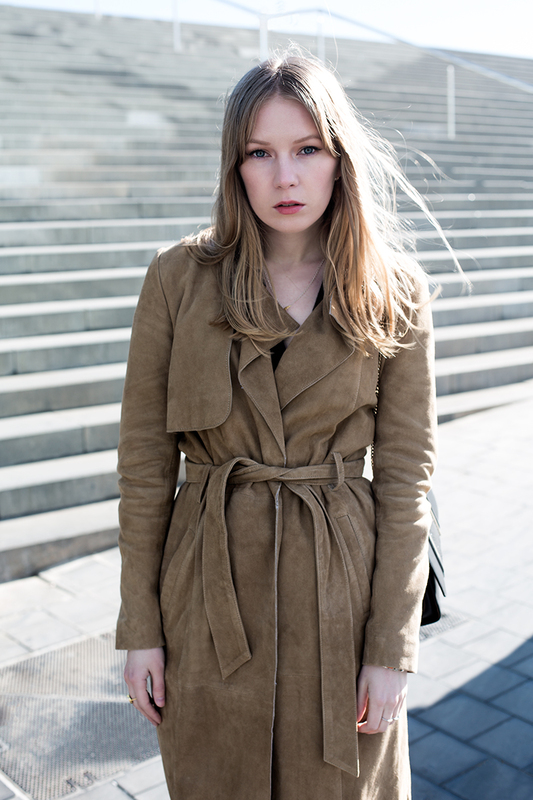 This entry was posted in Outfit and tagged 70s, coat, suede by Carolina Engman. Bookmark the permalink. In a really long time I haven’t liked a coat so much! Now I will be on the hunt for suede coat too! I love this look – that coat is gorgeous! http://trendkeeper.me .. TREAT YO SELF! Beautiful coat, love the colour! This outfit is so edgy and cool! I love the suede and the boots are perfect with it! And I am in love with your new hair! I wish I could pull of bangs! So minimalistic and so inspiring!! Love your new hairdo, it suits you perfectly! Cool coat, great booties and fantastic Jimmy Choo purse! I love your coat, so luxe. That coat is very nice! Very on trend for SS15! Love this coat, you’re so pretty!! Absolutely in love with this coat! I’m so into suede everything this season, love the 70’s vibe so much! Fabulous coat! I am loving the 70’s retro vibe. Definitely a coat that won’t go out of style and is a great wardrobe staple. This coat is stunning, suede is definitely making a comeback! that jacket is amazing! I love how it looks a little worn in! Love the classy chic vibe of this suede coat, beautiful piece! stunning coat! It loooks amazing with your new hairstyle! Great suede coat, perfect for winter and for an early spring as well! It’s amazing this coat! Looks so chic and I believe you’ll made so many outfits with it! Wow this is amazing!!! I love that coat so much, I think the coat is gorgeous! This coat is out of this world ! It’s unbelievably gorgeous !! Loooooooove that coat!!!! Total dream and you look such a sweetheart! Suede makes everything look so cute, I just love the texture! & bangs suit you so well!! Suede on coats, loveeeee! So Dainty and Chic! Another warm coat that doesn’t look baggy and looks cute.